As a global top 15 law practice, Eversheds Sutherland provides legal advice and solutions to a global client base ranging from small and mid-sized businesses to the largest multinationals. Our teams of lawyers around the world operate seamlessly to deliver the legal know-how and strategic alignment that clients need from their advisors to help further their business interests. Clients describe us as creative and well-versed in cutting edge legal work – we listen well in order to understand how and where we can be most effective and add the greatest value. We shape our advice to the unique circumstances and challenges of each project, and ensure the right people are in the right places to offer insight and certainty – from the day-to-day to the most complex, multijurisdictional matters. What unites us is our commitment to service excellence through a solution-oriented approach. We know our clients’ businesses, the industries and markets they operate in, and we know that great relationships yield the best outcomes. We provide the full range of legal services, including corporate and M&A; dispute resolution and litigation; energy and infrastructure; insurance and financial services; human capital and labor law; intellectual property; real estate and construction; and tax. We are consistently recognized for quality and innovation by our clients, the independent legal guides and leading industry awards. We have 67 offices and more than 200 relationship law firms around the world as well as formalized regional alliances in Africa, Asia Pacific and Latin America. From client matters that span jurisdictions to cases which require strategy that breaks new ground, we provide solutions to our clients’ most complex legal issues. Our collaborative approach ensures you will receive commercial insight across sectors and geographical boundaries through a centralized point of contact. We have top-tier legal talent with deep industry knowledge available in all sectors. When you instruct us, you will benefit from someone experienced not just in the law but in your specific industry. We are united by shared values and processes, providing a consistent, high quality service wherever you need us. A unique mobile app providing access to data breach statutes and notifications in jurisdictions across the globe. In 2016 we won Navigating and Influencing Regulation for our work developing the first authorized taxtransparent fund structure in the UK. Eversheds Sutherland Disrupt, our legal service for start-ups, won the innovation award at the British Legal Awards organized by Legal Week. Our innovative approach to pricing – making us accountable for all cost overruns – was a key differentiator in being appointed as sole legal advisor in 2017, replacing the 120 firms used previously. We were named as a Top Ten Game- Changer of the past ten years by the FT Innovative Lawyers Report in 2015. 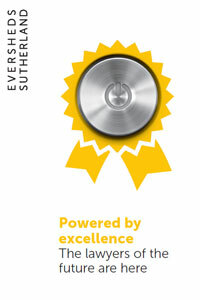 We were also ranked 8th in the FT50 list of the most innovative law practices in Europe. Our Consulting team offers a unique proposition: a leading management consultancy within a major international law practice. An intelligent and customizable online tool, DealMaster makes navigating multi-asset, multi-jurisdiction transactions as simple and efficient as possible. ES Unity is our efficiency-boosting matter and contract management application, which was built exclusively for the Microsoft Office 365/ SharePoint platform. Our work on Facebook’s London HQ was its biggest ever deal outside of the US and the first 21st Century development of a public square in the West End. Our map-based app allows users to access the most up-to-date US state and local tax information relevant to them.